For customers concerned about the European Union's General Data Protection Regulation (GDPR), here is some information that should help you determine if Execu/Vault fits within your compliance plan. Guest data is stored in an encrypted database. Backup archives of the database are again encrypted and password protected on the PMS server. Backup archives are transmitted over a secured connection to the Execu/Tech cloud storage. Backup archives are stored in the Execu/Tech cloud storage are on Bitlocker encrypted drives. Backup archives are only accessible to Execu/Tech staff, the backup application on the customer's server (to enable data restoration at the server) or via as-needed temporary FTP access provided to the customer or their approved IT professional. Backup archives are stored for 7 days, one for each day of the week. This means that if a guest requests that their personal information be removed from the database, it will take 7 days for this to be reflected in the archives, as a new backup archive which no longer contains this data replaces the older archives. Execu/Vault is an emergency backup and recovery service that we provide to our customers for a monthly fee. We store the last 7 days of backups on a remote server, as well as on your local network. If something should happen, like a server crash, virus, etc., we will restore the most recent backup at no additional cost. 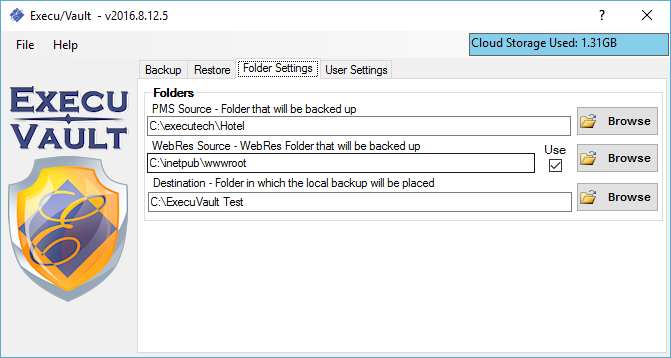 Execu/Vault will only backup the folder containing your Execu/Tech software. It will not backup anything else, including your hard drive, system state, email, etc. You'll need to contact Execu/Tech for your username and password. If you don't already have an Execu/Vault contract, it's quick and easy. Execu/Vault will only backup the folder containing your Execu/Tech software. It will not backup anything else, including your hard drive, system state, email, etc. Execu/Vault should not be your only backup! There are 2 very important steps you must take for Execu/Vault to work! ExecuVault2.exe MUST have an outgoing exception in your firewall. ftp://services.execu-tech.com or 13.85.71.254 - This application uses FTP (Port 21) or TLS (Port 990) to transfer files. https://services.execu-tech.com or 13.85.71.254 - This application uses HTTPS (Port 443) post to submit results and generate an email with the results. Grant any users that might be used to configure and test the application full control of the install folder. If you fail to do this, settings may not save and you may see an error reading "Access to the path 'C:\ExecuTech\ExecuVault2\ExecuVault2.ini' is denied." Execu/Vault requires Microsoft's .NET Framework 4.0. Microsoft .NET Framework Prior to installation, you must obtain an Execu/Vault User Name and Password from Execu/Tech Systems. While you can choose to install Execu/Vault on your own, it is highly recommended that you have the installation performed, free of charge, by Execu/Tech Systems support staff. If you do choose to install Execu/Vault on your own you will be emailed a link to download the application. Execu/Vault should be installed on the server where your other Execu/Tech Systems software is installed. Start Menu icons will be created for the application. At the end of installation the application will start and you will need to enter the configuration information. The default installation folder is C:\ExecuTech\ExecuVault2 but you can check the scheduled task that runs it to verify its location. In the Folder Settings tab you need to select the Source and Destination folders. Clicking the Browse buttons allows you to search for a folder or to create one in a specific location. The PMS Source folder is the folder containing the Execu/Tech Systems software to be backed up. The WebRes Source folder is the folder containing the WebRes online reservations interface. This is usually in the inetpub folder that's used by IIS. The Destination folder is the folder where the local backups will be stored. This location can be anywhere on the network and should be large enough to hold 7 days of backups at a time. This is intended to be a local backup location, not cloud or remote. We create our own cloud backup and we rely on the local backup for quick data recovery in an emergency. The User Settings Tab is where you will enter the User Name and Password provided to you by Execu/Tech Systems Support, as well as your Company Name and the Email Address that you wish to receive the backup reports. 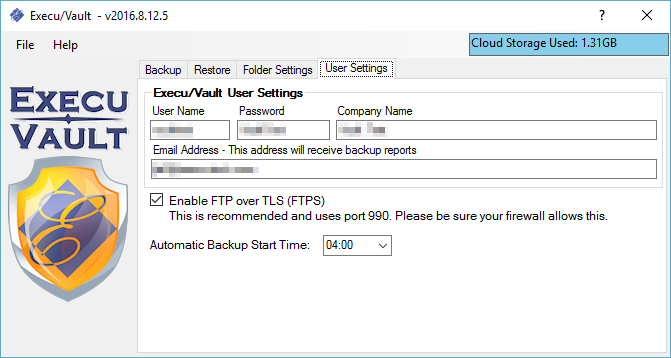 The Enable FTP over TLS (FTPS) checkbox allows you to enable secure, encrypted communication between your server and the Execu/Vault cloud server. We recommend that you do this to ensure the security of your username, password and backup data. While the backup data is placed in an encrypted archive prior to uploading to our server, enabling this option adds an additional layer of security. For this to work, outgoing traffic on port 990 must be enabled in your firewall. You also set the time at which the backup will be performed. The backup server expects to see backups from the previous business day to be uploaded in the early morning hours. The backup must be run in the early hours of the morning, AFTER your Night Audit, and before 11:00 AM Central Time. At 11:00 AM Central, our backup server sends out a report to us and each customer, notifying them of the status of their last backup. So, even if your Night Audit typically completes at 10:00 PM, the backup time should still be set to the early morning. This will avoid any false backup failure messages caused by the date of the backup. After entering your settings, save them by clicking File > Setings and then Save Settings. After your settings have been properly entered and saved, you should create the Scheduled Task. This Scheduled Task is what runs the backup at the appointed time. To create the Scheduled Task, click File and then Create Scheduled Task. The scheduled Task runs under the Local System account so be sure that this account hasn't been denied access to the Execu/Tech Systems software folder. To be sure you've entered the correct Email Address you can send a Test Email which is a mock up of an actual backup notification email using fake data. To send the Test Email, click File and then Test Email. This option allows you to download the latest version. After selecting this option, you'll see a notification when it's been downloaded. 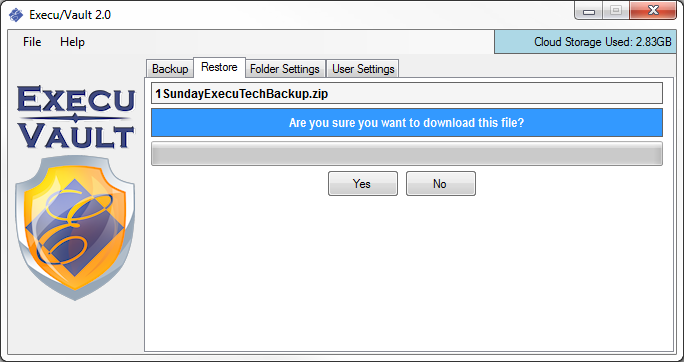 The update downloads into the Execu/Vault installation folder and is named "ExecuVaultUpdate.zip". Extract the files in this archive into the Execu/Vault installation folder. There is no cost for the update. 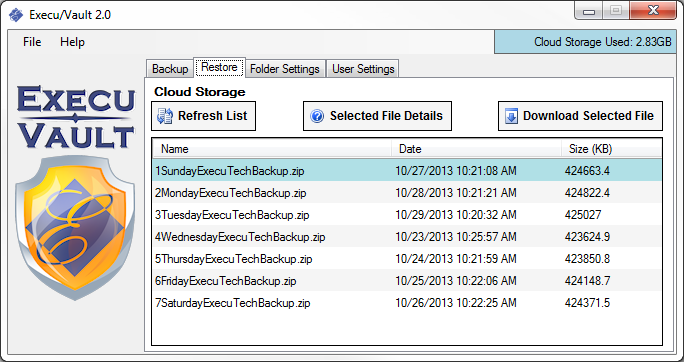 On the Backup Tab you will find two backup buttons - Local Backup and Full Backup. Local Backup archives the data and saves it locally, but does not transfer it to the remote storage server. Full Backup performs the Local Backup and then transfers the backup to the remote storage server. After clicking one of these buttons you will see information displayed letting you know the current status of the backup. None of this will be visible during the Scheduled Backup because it runs under the local system account. The Restore Tab presents you with several options designed to make the software restoration more automated. Refresh List does just that. It refreshes the list of backups current saved on the remote storage server. Company Name, Backup Start Time, Email Address, Source Folder, Destination Folder, Total Files Archived, Archive File Size, Local Backup Duration, Remote Backup Duration, Remote Backup Upload Speed, File Names Backed Up with File Size. Download Selected File downloads the currently selected backup archive. When you click this button you are asked if you are sure you want to download the file. When the download is complete, you will see three options. 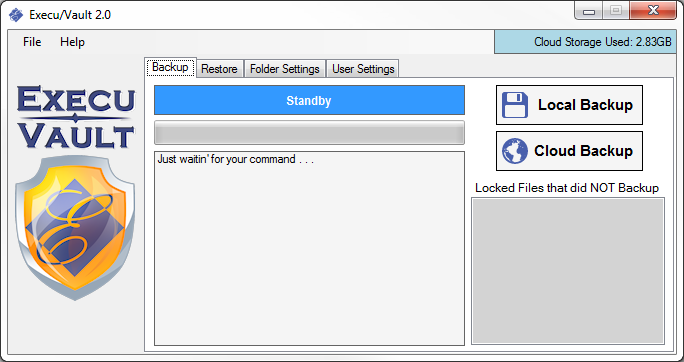 After downloading the backup we recommend that you select the Run Software button to test the backup and see if it contains the information you are looking for. You might just want to look at the state of things on a certain date from the past week or you might want to make sure that you've gone back far enough to recover the data you're wanting to restore. After selecting a terminal number to run the software as, you click the Run Software button. The software will extract to a temporary location and will run just like it would at the front desk but you will be seeing data as it was at the time of the backup you downloaded. You can select this option to extract the files to a temporary location and open a Windows Explorer window to this location. After you have run the software and verified that this is the backup you want to restore, click Restore Data. You MUST be sure that all interfaces have been stopped and that all users have logged out of any Execu/Tech Systems software. 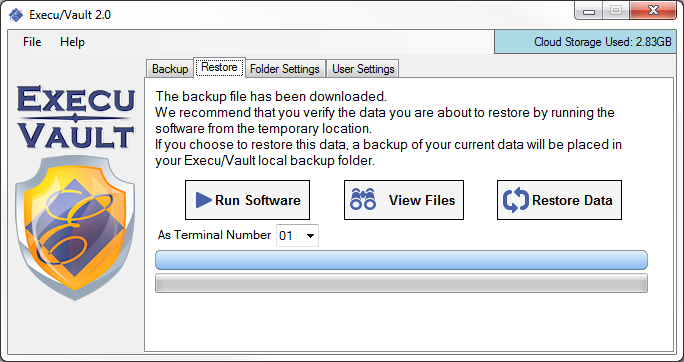 A backup if your current data will be placed in your Execu/Vault local backup folder and the data from the downloaded backup will be restored to your software folder. You will find the backup archives in the Destination Folder. Use 7-Zip, WinRAR, WinZip, etc. to extract them and you'll need to contact us for the password. The archives cannot be extracted by Microsoft's built in Compressed Folder function.